The Silver Heritage Area of Upper Clear Creek will conserve water, plant and wildlife resources and preserve vistas and history where Colorado’s silver mining began. Central theme: The history and cultural artifacts of Colorado’s premier 19th century silver mining district lies in the watershed of Clear Creek, South Clear Creek and Leavenworth Creeks. The development of the Mineral Belt in Colorado through mining and associated industrial and commercial endeavors is the most evident and carefully preserved within this district and yet remains accessible to the public. Industrial History: mining, timbering, and artifacts. Commercial and Residential History: towns and town sites. 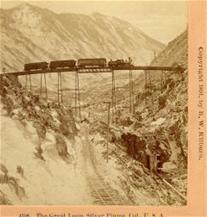 Transportation History: railroads, wagon roads, and burro trails. Sub theme: The Silver District has attracted recreational activities and commercial enterprise through its history offering both cultural tourism and a variety of recreational opportunities. Transportation: conduit role of Upper Clear Creek. Historic Tourism: 19th century tourism and sites. Cultural Tourism: visitation to historic sites. Commercial Activities: tourism and other. Recreational Uses: multi-seasonal outdoor activities. Sub theme: The Upper Clear Creek watershed has continuously provided water for the development of Colorado. Natural History: geological formation and snowpack. Cultural History: impact of mining and timbering. Water and Control: alterations of water course. Water Quality: impact of intrusions. Water Rights and Uses: demands for water. Sub theme: The plant and wildlife of the district has been recognized as a significant attribute of the district since earliest settlement. Natural Resources: the variety of climate zones and species. Cultural Resources: historical botanical explorations. Species Management: habitat identification and protection. Human Impacts: recreational and commercial effects. The central purpose of the Silver Heritage Area of Upper Clear Creek is to create a sustainable recreational and tourism plan for the area while retaining the area’s distinctive character and quality of life. In order to accomplish the purpose the area partners must gather existing promotion and interpretation plans for sub areas, relate tourism/recreational plans to cultural and natural resources planning, create an overall interpretative plan, delineate a public education and information process and seek public, governmental and agency input and support. The Silver Heritage Area encompasses the upper drainage of the main branch of Clear Creek and its tributaries including South Clear Creek and Leavenworth Creek. The heritage area commences at the eastern edge of Alvarado cemetery and follows the northern ridgeline along Douglas, Democrat, Republican, Sherman, Bard, Parnassus and Woods Mountains to the continental Divide at Pettingell Peak. The boundary follows the Divide south to Argentine Peak and then traces the National Forest boundary to Gray Wolf Mountain. It proceeds along the ridgeline of Sugarloaf, Independence and Alpine Mountains until it intersects the road in the South side of Woodchuck Peak and Saxon Mountain. It descends from Saxon Mountain down the gulch to the point of beginning.